ABOVE: Sleeping cars in Lisbon's Santa Apolónia Station. INSET: An illuminated sign on Coche 13, and a map with Lisbon and Madrid highlighted in red. Lisbon and Madrid are the two major capitals of the Iberian Peninsula, and no trip to Portugal and Spain is complete without a visit to both. By air, the two cities are only about an hour apart, but ground transportation, check-in time, and security checks will add several hours to the trip (especially if you need to wait for a checked suitcase). A pleasant alternative worth considering is the Lisbon-Madrid or Madrid-Lisbon Night Train--especially if you're traveling with a Eurail or InterRail pass, which provide substantial discounts for passholders. By sleeping on the train, you'll save the cost of a hotel for one night, and you won't waste your daylight vacation hours at an airport. Depart Lisbon Santa Apolónia Station 9:25 p.m. Arrive Madrid Chamartin Station 8:40 a.m. 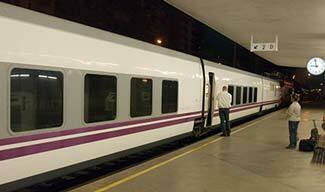 Depart Madrid Chamartin Station 9:43 p.m. Arrive Lisbon Santa Apolónia Station 7:30 a.m.
Madrid's time zone is one hour ahead of Lisbon's, so remember to reset your watch before going to bed. If you're connecting between Madrid and other major Spanish cities (such as Seville) by high-speed AVE train, you'll need to transfer between Chamartin Station and Atocha Station across town. This is easy, since local and regional trains run frequently between the two stations. The Lusitánia Comboio Trenhotel isn't a luxury train like the Venice-Simplon Orient Express or the Royal Scotsman. It's new, clean, and comfortable, but its purpose is to transport you between Lisbon and Madrid, not to pamper you with the railway equivalent of a five-star cruise. ABOVE: A reservation card and envelope from CP Portuguese Railways. International ticket vendors such as Rail Europe. If you're traveling extensively by train, consider a rail pass from InterRail (for residents of Europe) or Eurail (for travelers from outside Europe). Many different passes are available, including "Global Passes" that work throughout Europe and regional or single-country passes such as Eurail's Portugal-Spain pass and InterRail's Portugal and Spain passes. 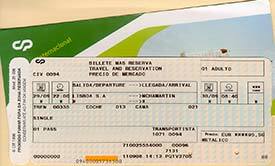 With a rail pass, you won't need to buy a ticket between Lisbon and Madrid: You'll need only a seat or sleeping-car reservation, which you can obtain within a month of departure at a railroad station, an authorized travel agency in Europe, or an online ticket and railpass vendor such as Rail Europe. This page from the Spanish National Railways (which operates the night train) covers the basics for the various Trenhotel routes, including Lisbon-Madrid. Another page describes the new train cars. Also see Eurail's Trenhotel page and The Man in Seat 61's Trenhotel Lusitania page. Map scan copyright © Nicholas Belton.